Sand exposed to the hot sun or chilly weather conditions can potentially cause injury to unprotected feet. Sand Socks by Vincere Sports provides the ideal protective solution for feet on very hot, ice cold or even abrasive sand. They have become a popular and often necessary accessory for recreational and professional sand volleyball players throughout the world. Sand Socks are available in a wide variety of sizes, colors and print patterns. The two general styles are the classic high top and the new sprites low top. Sand Socks for kids and split toe versions are also available. Solid color options include black, white, naked, pink and more. Sand Socks caters to a variety of aesthetic preferences by also offering various print patterns like the eye catching Camo Love, stand-out Pink Zebra and dreamy Purple Galaxy. The greatest number of reviews for Sand Socks can be found online at amazon.com. The majority of the nearly 300 reviews give a well-deserved 5 star rating. Although most of the reviews are positive, some lower starred reviewers have noted and highlighted issues that are definitely worth considering before purchasing. Review these Pros and Cons below and see what avid sand volleyball players have to say about Sand Socks in the following video. “Awesome!” “Great Socks!” “An absolute must have for sand volleyball” are some of the most common positive responses of nearly all of the 5 and 4 star reviewers. 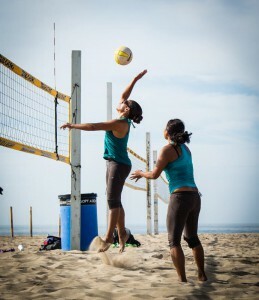 Even though most of the reviews talk about sand volleyball, Sand Socks are also being used for sand soccer, ultimate Frisbee, fishing, snorkeling or just walking along the beach. Many reviewers mention burned, blistering and cut-up feet prior to Sand Socks. A good number of reviewers from colder states reported that Sand Socks protected their feet from potential frost bite, keeping tows nice and warm in frigid sand. Reactions to sizing options and overall comfort was very positive. Almost all of the reviewers were able to connect with a size that fit perfectly or well enough. One of the most appreciated features of the high top style was the Velcro strap. Reviewers like that the strap secured the socks and kept the sand out. Those who bought Kids and Sprites versions made it a point to mention that since these styles did not incorporate a Velcro strap, more sand and dirt made its way into the socks. Some of the top criticisms of Sand Socks by reviewers who gave a 3 or 2 star rating mentioned poor durability and issues with construction and quality of the materials. Most of the critical users reported ripping, holes, loosened stitching and busted Velcro straps after only a few uses. A couple reviewers have settled with having to purchase multiple pairs in anticipation of them becoming worn out or shredded in a short amount of time. Inaccurate sizing and a slippery fit was mentioned several times. Vincere Sports is very active in their development of new products while also very committed to the improvement and fine tuning of their existing products. Sand Socks appear to be the perfect solution for making sure feet are protected on hot, cold or rough sand. Sand Socks by Vincere is available directly from their site www.sandsocks.net or through most online retailers that carry outdoor sports and recreation equipment. One of the top distributors of Sand Socks is amazon.com. Some of the benefits of ordering through amazon.com include free shipping for most orders, easy returns and access to hundreds of user reviews and discussions specific to Sand Socks.